When the Empire rises in the wake of Revenge of the Sith, it doesn't merely want to rule the Galaxy with an cybernetically enhanced fist; it also wants to win hearts and minds. 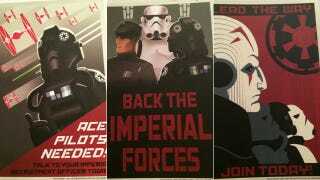 So the Star Wars: Rebels team developed propaganda posters for the fledgling Galactic Empire. It is by Imperial Decree that you are requested to proudly display these posters on behalf of your Empire. As loyal residents of one of the Empire's most vital stations on the Outer Rim, your compliance is appreciated. Imperial Service is a noble endeavor which paves the way for your freedom and security. Remember, it is the will of Emperor Palpatine to ensure the future of a stable and prosperous galaxy.